Getting a passport is fairly easy. All you do is go to the US Department of State website page for passports and follow steps 1-9. If you already have one make sure it will still be valid during your trip and meets your destination’s validity requirements. Many countries will require 6 months of validity and/or a specific number of blank pages when you arrive at customs. Don’t get caught off guard, check entry requirements and make sure your passport is valid as soon as possible. If it doesn’t meet the required conditions you may need to renew it. TIP: You will have to send the original copy of your proof of citizenship so do make a photocopy in case you need it while your application is being processed. You will get the original copy back once the application has been processed. This is the fun part. Think about where have you always wanted to go or what have you always wanted to see. Skim through Instagram for inspiration or ask your friends where they have been. With a passport, the world is at your fingertips! TIP: If you’re having a hard time choosing, look at top destination lists and see if any places stick out to you. 3. FIGURE OUT YOUR BUDGET! Now that you know where your first trip will be, it’s time to budget! What kind of experience are you looking for? Do you want to spend your time at an all-inclusive or do you want to spend most of your time out of your hotel? Depending on what you’re interested in your budget needs to match your expectations. TIP: Some credit cards will give you points to put towards your purchased travel expenses. Rack up enough points and you may be able to get some upgrades! 4. DECIDE WHEN TO GO! A couple things to look at when you are deciding when plan your trip are the weather and events. Pricing may be a bit high during holidays or national events and its key to keep in mind what’s going on in your destination during the time you are looking to visit as that may affect your travels. TIP: Escape the heat of the summer or the harsh winter by traveling to the southern hemisphere where the seasons are opposite from ours. For example, spend a week in December getting a tan on a beach or cool off in July by enjoying a chilly game drive on Safari. 5. CONTACT US TO HELP YOU PLAN THE REST! 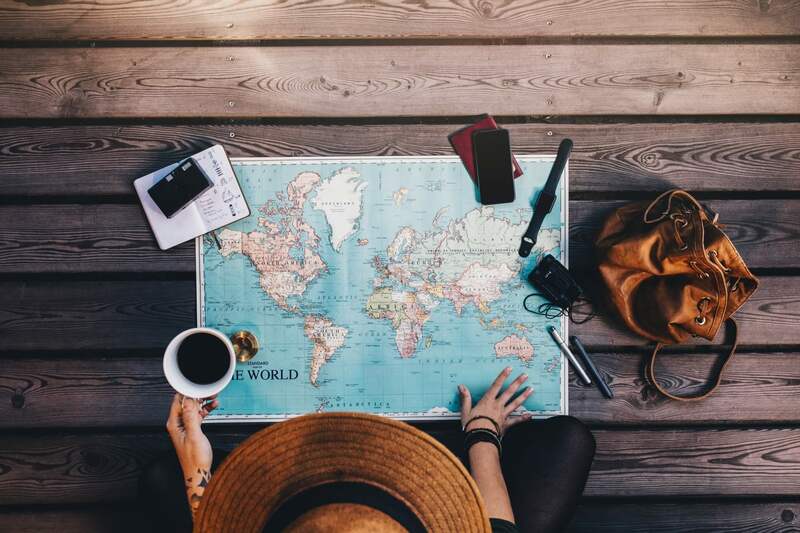 Once you’ve gotten your passport, figured out your budget for your destination and the time you would like to visit, call your travel specialists to help you put the rest together. Planning your first trip to a foreign country can be daunting but it doesn’t have to be. We are here to help make your dream vacation come true! 6. APPROVE THE ITINERARY & BOOK YOUR TRIP! Here at DSA Vacations, we are able to tailor-make your vacation to fit your expectations and budget. We will work with you to create the trip you envision and take care of all the little details. All you have to do is approve an itinerary and book your trip! TIP: Whenever booking a trip, whether it is with us or by yourself, make sure all your information matches what is listed on your passport. The last thing you want are discrepancies in a foreign country or to not even be allowed on your flight! 7. TIME TO START PACKING! Woo hoo! The hard part is over and now all you have to do is pack. No one will judge you if you get a bit overexcited and pack months in advance. One thing to keep in mind is the size of your luggage and if it will be approved by the airlines you are using for your trip. Also, try not to pack too much as you will definitely want room for souvenirs. Not your professional packer! . How does one even pack a check baggage much less a carry on?!! My suitcase ALWAYS seems to be a “Mary Poppin’s” bag. I mean everybody needs 22 pairs of black leggings and a pair of jeans that never gets worn…right?! . Please HELP! What’s your expert packing tips? TIP: Maximize the space in your luggage by rolling multiple layers into one bundle. In a perfect world everything would go according to plan 100% of the time. Unfortunately, we aren’t so lucky sometimes. Be sure to pack essentials in your personal bag or carry on. ALWAYS, keep your bankcards and passport close to you. Before you board your plane its important to notify your bank you will be leaving the country and possibly using your card and/or withdrawing money from foreign ATMs. Most airports will have a kiosk where you can exchange cash as well so you may want withdraw money from your bank before you depart. TIP: Some credit cards allow foreign transactions without fees! Make sure to do your research to find if and which credit card is right for your trip. You are done! Your trip has been planned, you are packed, and your first international trip is finally here. However, don’t feel like you are alone. DSA Vacations works with fantastic tour operators and if anything goes awry during your trip you will have someone to call and assist you – a nice perk of booking with us. TIP: Try to get to the airport no later than 3 hours before your international flight. Check in and the TSA screening lines can stretch long and the best way to avoid running to your gate is by being at least 3 hours early. We hope you are now prepared to start planning your first trip with us and if not, feel free to give us a call!